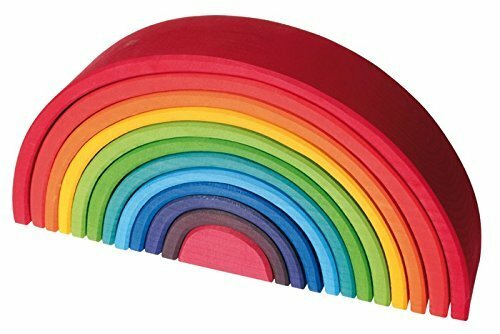 The bold colors of this beautifully handmade wooden rainbow will fire your child's imagination and creativity, and provide hours of open-ended play. This amazing Waldorf-inspired multi-use toy for toddlers, kids and adults is Grimm's the largest rainbow, measuring over 14 inches long, with 12 colorful pieces. This wonderfully simple, yet versatile design has endless possibilities. Children will learn about colors, refine hand-eye coordination and motor skills, as well as expand their creative abilities, while being immersed in critical thinking and deep play. Stacking, nesting and building stimulates reasoning skills, essential problem solving activities for children. The tactile nature of wood and bright colors will stimulate both very young as well as older children. When not nested, kids can use the colorful arches as bridges, tunnels, fences, and any number of unique creations. The rainbow can be telescoped and stacked in a variety of creative ways. Use the arches as targets for marble games (look for both sizes of Grimm's wooden marbles!) The pieces can be used together or individually as bridges, tunnels, seesaws, fences, houses, doll cradles or caves. The possibilities are boundless! With so many uses for this heirloom-quality Rainbow, this is a toy that will accompany your child for a long time and will surely be rediscovered many times along the way. Grimm's aims to help children discover and develop their own creativity. Comes minimally packaged in clear shrink wrap. Size is 14.4 x 7.1 x 2.9 inches. All colors are water based and in accordance with EN 71, are harmless to your health and suitable for children toys. Please note: The rainbow can only be nested from one side. This adds another problem-solving element to the "puzzle" aspect of this toy: if the arch will not easily nest under the previous arch, it must be flipped over horizontally, and should fit from that side.